In a large mixing bowl, mix together salt, nutmeg and 4 cups flour until combined; set aside. In a small bowl, combine lukewarm milk, sugar and yeast. Stir and let rest about 10 minutes until yeast activates (you will notice bubbles forming). If yeast does not froth up, do not continue — your dough will not rise. Add eggs and butter to yeast mixture and stir. Pour yeast mixture over flour and mix about 5 minutes using the dough hook attachment. Add raisins and mix another minute or until dough is soft and elastic. If dough is too wet, add more flour as needed. The dough is done when it doesn’t stick to the sides of the bowl anymore. Place a tablespoon oil in a large bowl and add dough. Roll dough around until completely coated with oil. Cover with plastic wrap and let rise about 2 hours or until doubled in size. Preheat oven to 375 degrees and line a baking sheet with parchment paper. Place dough on a clean, lightly floured work surface and divide into 15 even pieces. Roll each piece into a smooth ball and place on the prepared pan, leaving enough space for dough to expand. Cover (but don’t wrap) with a clean damp towel and let rest 30 minutes until doubled in size. Bake 20 to 25 minutes or until golden brown. While baking, make glaze by mixing sugar and water in a sauce pan. Bring to a boil over low heat and then boil another minute or until glaze thickens; set aside. Place icing ingredients in a small bowl and whisk together until combined. Add to piping bag and refrigerate until ready to use. When buns are done, remove from oven and brush with glaze. 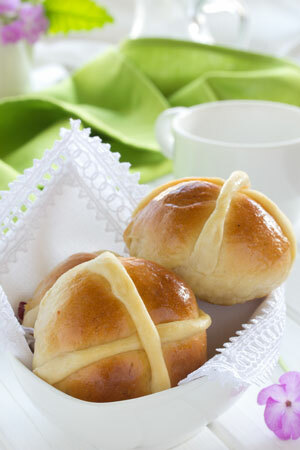 Let cool 5 to 10 minutes and then pipe icing over buns to form a cross. Makes 15. Published on April 1, 2019 in Food, Side Dishes.